The Skinny: Retro Hong Kong horror comedy lives up to it's genre and proves entertaining, but by now the laughs may have been reduced to chuckles. Retro fun exists with this semi-enjoyable horror-comedy from two men who would go on to do greater things: Jeff Lau and Wong Kar-Wai. Lau directed this tolerably fun flick that's coherent by Jeff Lau standards. What that means is the film itself is messy and without any real pacing, but at least the nonsense doesn't become distracting. 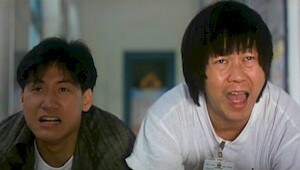 Ricky Hui and Jacky Cheung star as Chiu and Macky, two wacky cops who are witness to the resurrection of an evil Japanese vampire. It seems their police station was once a club for Japanese officers, but after the war they all got together and committed seppuku (ritual suicide). As a result, the station is haunted by the evil Japanese Colonel, who returns and promptly takes out lowlife thief Ming (Billy Lau). Chiu and Macky accidentally burn Ming up with sunlight, but no one believes them. To regain their credibility, the two attempt to prove the existence of creatures of the night to their fellow cops. This entails lots of wacky shtick, overdone mugging, and even a little tasteless dog butchering. What this all means is anyone's guess, but the filmmakers apparently weren't attempting anything serious or even remotely weighty. Wong Kar-Wai may have co-wrote the script, but it possesses none of his trademark post-modern self-reflection. Instead we get slapstick and potty humor. How refreshing. As an older Hong Kong film, The Haunted Cop Shop gets points simply for adhering to the eighties HK formula. That means all-out screwiness with no excuses. The energy and nonsensical humor can be fun, and Jacky Cheung and Ricky Hui are likable enough fellows. There are also some occasional moments of effective suspense, and some action that'll please the fans. And the "Crazy Mustache" guy from Yes, Madam makes an appearance as a Taoist priest. HK Cinemaphiles who choose to dial up this flick will most likely get what they expected. image courtesy of Mega Star Video Distribution Ltd.